This sloop was designed in 1914 by Nathaniel Greene Herreshoff. 402 were built in his boatshop in Bristol Bay, Rhode Island over the next 40 years. They quickly became the most popular boat ever designed by the Captain. Shackled was launched in 1932. Her overall length is 15'9" with a waterline length of 12'6". Ballast is 735 pounds of lead in her keel which keeps her steady with a big ship feeling. 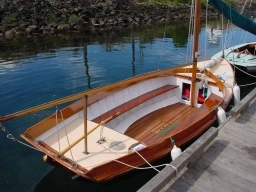 This 12 1/2 was shown at the 2005 Wooden Boat Festival in Port Townsend, Washington.